Find Journeys of The Zoo on Google+ Journeys of The Zoo: Optimize Your Child's Development with My Baby Compass. My girlfriend is pregnant with her first child. Like any Mother (first time or not), she is concerned about doing everything she can with respect to her Child's Development. In turn, I was really excited to receive "My Baby Compass (Birth-Two years)" in the mail. I hoped that Kathryn Thorson Gruhn's 35 years of child development experience would be useful to her as she embarks on this wonderful journey. The "How" and "Why" sections on Baby Development contained some really interesting information. For instance, did you know that Nine out of 10 children will experience ear infections that cause temporary hearing impairment, but only three of those will be diagnosed? This is an important point because even mild hearing loss can affect a child's development of speech and language skills. While the background information sections are worth informative, things really pick up at Chapter Five: Age Appropriate Toys and Playtime. For my own kids, I like the idea of having a Daily Activities Picture Calendar that helps to demonstrate the schedule and order in which we do things every day. Such as eating breakfast and getting dressed. Chapter Six includes Music and Rhymes for Fun and Learning. If you don't know the melody for something, the best part is, neither does your baby. You can either make it up as you go along, or check out sites like YouTube to help you along. The first Appendices include common vocabulary and sign language for use when interacting with your child. Lots of these words appear in common children's books and the world around us so you are likely using them on a daily basis as you go about your day. Did you know that "Some theories state that a child needs to hear a word, on average, 800 times before it is ingrained"? That explains a lot! Further Appendices include information on developmental screening and support, a list of terms and definitions, recommended websites and additional reading resources. My absolute favourite part of this book are the removable (read: portable) booklets for different age ranges (within the first two years). These booklets include developmental checklists and age-appropriate activities. My Child's Development Is Important! 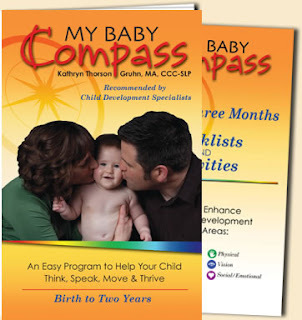 Find out more about My Baby Compass by connecting with them. This sounds so handy! What a great idea, and I love the idea of the removable booklets as well! Sounds like a pretty nifty book, especially the check lists, I love lists. This would have been super handy when my kiddos were two and under. Oh I like the idea of this! I agree, checklists are awesome! Sounds like a handy book! Hmmm...I think I'll have to look into this. My friend is expecting her first baby too. I hadn't heard of this before and I think it would have been really handy for me as a preemie mom. It is hard enough to track development with a regular full term baby but throw in all the preemie stuff and ... yikes! What a great product, I'm going to have to check them out! Another one of those products I wished I had when I was having babies. Looks and sounds good! I love this thanks for sharing! I wish I had had something like this when my daughter was younger it would have helped so much. She had several ear infections scary. Sounds like a wonderful reasource!